Almost a year I quit smoking, I remember when I decided to get rid cigarette of my life, I was designing Optimus Peterbilt Truck papermodel. It was so hard, and still hard to forget its temptation. 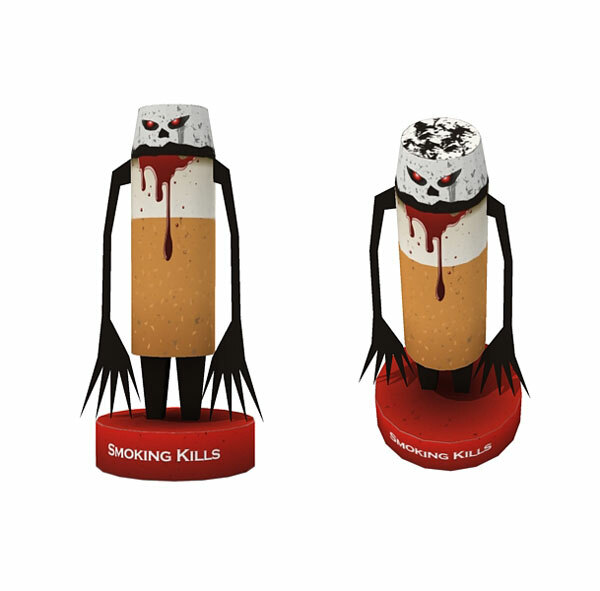 It supposed to release yesterday, here it is smoking kills papertoy made for this day World No Tobacco Day 2010. World No Tobacco Day is observed around the world every year on May 31. It is meant to encourage a 24-hour period of abstinence from all forms of tobacco consumption across the globe. The day is further intended to draw global attention to the widespread prevalence of tobacco use and to negative health effects, which currently lead to 5.4 million deaths worldwide annually. The member states of the World Health Organization (WHO) created World No Tobacco Day (WNTD) in 1987. In the past twenty years, the day has been met with both enthusiasm and resistance across the globe from governments, public health organizations, smokers, growers, and the tobacco industry.